If you're looking for your daily serving of Crushed Cheerios, you can find me at my new location! I'm excited - things are starting to grow in the garden and we've been able to eat a few things from it already! Last weekend, my poor, poor pea plants (they are looking very pitiful) had a handful of pods to pick off and eat. 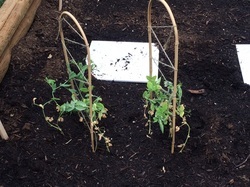 They were great - Dean and I enjoyed opening them and picking out the peas. The pods were pretty tasty too but Dean wasn't a huge fan of them as they are a bit stringy. Yesterday, I pulled our first (and currently only) ripe strawberry. Dean's been watching it turn red this past week and asking if it's "eat time" yet. He just couldn't wait to get his hands on it. I can only imagine him once the plant really starts growing - He'll be hiding in the garden, snacking away. We brought it inside and cut it into three little pieces, one for me, one for Dean and one for Daddy since he's been watering the garden the past couple days that I've been working and getting home late and tired. I suppose we could share with him... He has been watering the garden the past few days when I've been getting home later than him. Other things are growing at a great speed (this farmer is a bit impatient!) I've been eyeing my tomato plants for signs of fruit, but it's just flowering now so it will be another few weeks before I get any fruit off it. Everything is starting to sprout though so I feel a bit reassured. Turns out I have somewhat of a green thumb! Dean has been getting better about not stepping on the plants and not digging in the garden when I turn my back for a split second. We've been telling him that it hurts the plants and that things might not grow if we dig them up. There's the occasional threat of going inside if he doesn't stop jumping on the strawberry or the pumpkin plants, but it usually just takes one warning. He likes his outdoors time - he doesn't want to have to go inside! Radishes anyone? 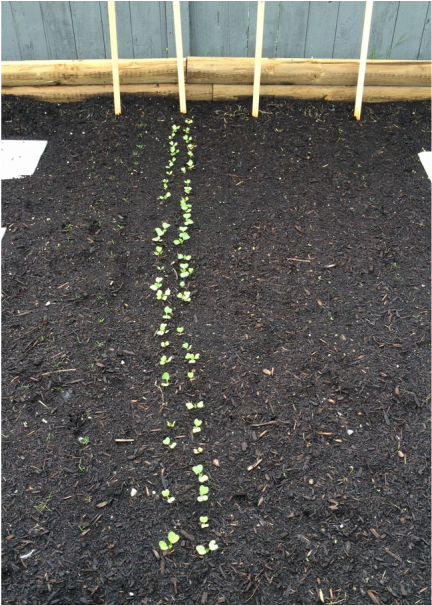 Carrots and lettuce are sprouting on either side of the radishes. Looking forward to being able to make salads from the garden soon - Fresh cucumbers, lettuce, tomatoes, radishes and peppers. YUM! On Tuesday we went for our 20 week anatomy scan. It's one of my favourite parts of pregnancy - getting to see the little monster moving around in there, watching them stretch and curl up. Seeing their cute little profile. First of all, let me say, I had a wonderful experience at MedRay in Coquitlam. They are a private clinic but covered with medical at no extra cost. The clinic has a great "welcoming" feel to it. And the two receptionists I spoke with were very helpful and patient. And because we were 20w3d, we were able to find out the gender at the exam! The technician I had was terrific. The past five ultrasound tech's I've had (this pregnancy and last) have been very serious and only interested in doing their job and not making small talk while you lay on the bed, waiting for them to check your baby and make sure they are healthy while not telling you if anything is wrong, even after the scan. This technician was very friendly and asked lots of questions about my 21 month old. She also made lots of jokes about how I was going to have my hands full with this one because they wouldn't stop moving. Baby was even trying to shove the ultrasound wand away when the lady was poking them to try and have them shift for a better view. It was the typical ultrasound where my husband had to wait in the waiting room. I spent about 40 minutes laying on the exam table while the technician tried to coax baby out out of hiding so that she could get the measurements done. Baby kept hiding behind my belly button or turning away. They also kept kicking and pushing at the wand to try and gain some of their personal space back. Baby was constantly on the move. After all the measurements (minus the spine because baby was being stubborn and wouldn't give a clear view of it so now I have to go back and get it redone in the next 12 days), she called in my husband. Jason and I got to watch the monitor as she started from the top - showing us the profile view, the heart, the arms and fingers, legs kicking and then finally, the moment we were looking forward to - finding out the gender! Turns out Baby 2.0 is a boy! 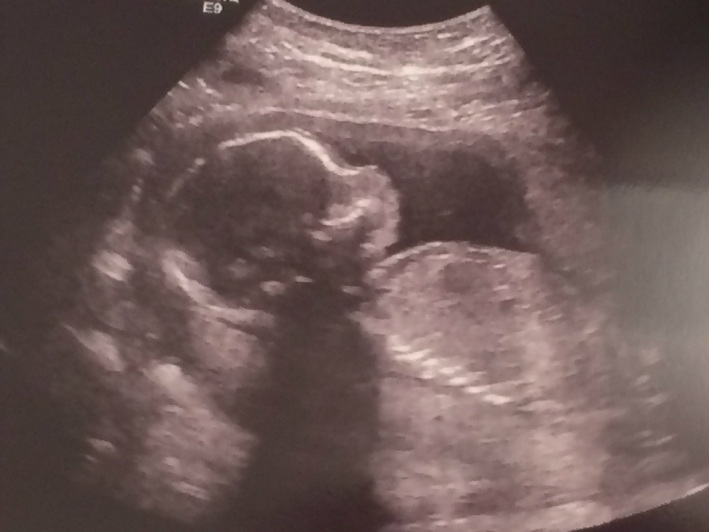 There's always a little room for error with ultrasounds, but there's no denying this one! Am I disappointed that baby is a boy? Nope! I don't feel cheated or sad that Baby 2.0 isn't the girl we were hoping for. If anything, two boys makes life easier! We have everything we will need, clothing and gear wise, for another boy. Activities when they are older will be easier to coordinate. Family outings will be a bit smoother. And I won't have to deal with tea parties and dolls, hair and make-up, and teenage girl drama. Though, I will be scheduling showers on a bi-daily basis and requiring hourly deodorant applications throughout the teenaged years. And hey! We don't have to repaint Dean's rooms when we are preparing for Baby 2.0 after we move Dean into our room (and our room into the spare room!) Plus, as Jason so joyously pointed out - we don't have to move Dean's dresser that has blue doors. We can just build the new one into Dean's new room! I'm slightly terrified for being a SAHM with two boys, barely two years apart, but one day at a time. But bring on the fart jokes and burping contests! Remember when we tried to switch Dean into his big bed, back in February? Remember when it was a complete flop? Well, fast forward three months later, he'd spent a few nights in his big bed here and there. But he was definitely not ready for the transition. Then one week ago, at nap, he pointed to his big bed that had been newly raised onto the box spring (but no frame) and said "nigh-night big bed!" as we told him goodnight... Jason and I swapped looks (you know, the "are you going to deal with this?" look) and shrugged. Why not, right? Since then, every single bedtime and nap have at least started in his big bed. 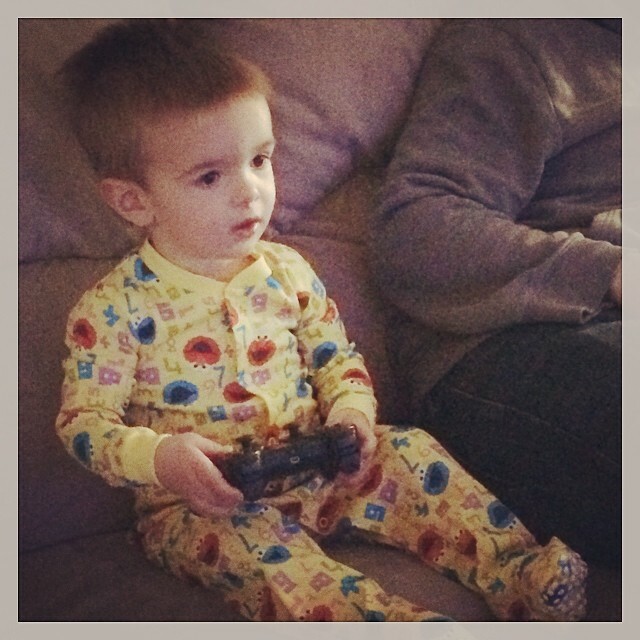 We've been toying with his bedtime lately, as he's not as tired at 6:45pm anymore and is sometimes playing until 8pm. And having the freedom to be able to get out of bed... Well, that doesn't go well when he gets bored trying to fall asleep. With this new change, he's had a few nights where two warnings have resulted in being stuffed, er, placed, into his crib when he can't seem to stay in his big bed. Yup... My son is transitioning himself from his crib... Without any real help from mom and dad. Then today, after dinner, he points at his diaper after I strip the dinner-coated clothes off, and tells me "pee-pee". I have tried a few times to get him to try to sit on the potty without a diaper but he's never really liked it and only lasts until his naked bum hits the seat and then he's stuffing his potty back beside the toilet. I figured this was going to be the case so we ran to the bathroom, took off his diaper and he actually sat on the potty, fully, for more than a split second. In fact, he sat on it for about five minutes. He kept telling me that he had to pee so we waited it out. Nothing. He lost some interest in it so he went into the bath for a little bit and then I got him out, stuck his bedtime diaper on and we ran to his big bed for PJ's. He decided he wanted to go pee again, so we trekked off to the bathroom, stripped down again and he sat - AND PEE'D! Part of me is so over the moon that he's growing up, The other part of me is devastated that my little guy isn't so little anymore. And deep down, there's a tiny part of me that is terrified of the enormous amounts of laundry that happen with potty training. Some toddlers scream and collapse to the ground in a fit of rage when you ask them to help you clean up. Mine? He demands tasks. He will ask "more? more?" until you're so desperate for a task for him to do that you start "dropping" carrot peels so he can pick them up and throw them out while you are peeling carrots for dinner. Dean likes to sweep, as most kids do. Since he was 14 or 15 months, he would play with the little broom and dustpan, sweeping into it and then dumping it into the garbage. Give him the broom outside? He will start putting dirt from the garden onto the walkway and cleaning it up. He likes to push the shopping cart now. At 20 months old, he has decided he is too big to sit in it (unless it's a cool car shopping cart then suddenly both his legs are broken and he has to sit down) He has a blast cruising down the aisles of the grocery store, playing "I Spy" until we find the item needed, and then putting it in the cart. He also likes to try to sneak a few extra items in there... You know, in case we wanted a jar of sauerkraut. Today he learned how to work the hose. And the realization that I am never going to get to use the hose with him around without having to fight over it is sinking in. He had so much fun just spraying a fine mist in the garden. He then decided he was thirsty so he kept trying to drink it while spraying it away from him. And then there were a few times that he pointed it at himself and pulled the trigger... Getting a face full of water! He was pretty quick to toss the hose down and come running over to me with this look of half-enjoyment, half-WTF-just-happened. Every time, he would tell me "water!" and then go running back to water the garden again. 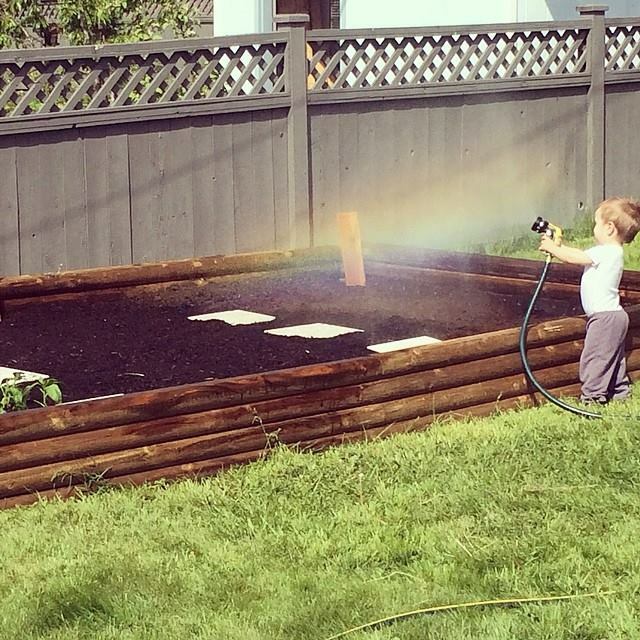 And he actually did really good with watering the garden! I think I will have to enslave, I mean... enlist, him to help me water everyday! Does your little one like to help out around the house? Do you add extra work into a task just so your child can help out and feel included? I Got Dirt For Mother's Day - And I Am Thrilled! Stay tuned for updates of what's growing! Happy Mother's Day to all the moms and soon-to-be moms out there! This year, my husband spoiled me. No, I didn't get a bouquet of gorgeous flowers that I will end up killing within two days because flowers hate me. ﻿One thousand, five hundred, sixty eight pounds worth of it. Yup, you read that right. My husband spoiled me and got over 1500 pounds of dirt. Jason, a sometimes-handy-man (okay, most of the time - and if he doesn't know how to do it, he will google it and figure out how to sort-of do it..) built me a raised garden bed a few weeks ago. This weekend, after a few weeks of bugging him about it, the dirt went on sale at Home Depot and so my husband made five trips and brought home 56 bags of dirt, hauled them into the backyard and emptied them into the garden bed. Within a couple hours I was already out there playing in the dirt, with Dean alongside, of course. I'm so excited for all the awesome vegetables I can grow this summer! I've never gardened before so I have no idea what I am doing... But hey, I've grown 1.5 children, so how hard can it be?! I have a seasoned friend who is helping me and is my go-to for all my questions and random thoughts. (I know, poor woman, right?) but one of the best things about this day in age is that I can go on Google or Pinterest and figure out what to plant, when, how much maintenance is needed, how damp they like their soil and even what not to plant beside each other. Who needs the "Gardening For Dummies" book?! We have tomatoes, peas, cucumber and pepper plants in the garden. We put green and white onion bulbs in today. We have cilantro, parsley, basil and dill seedlings that need to be moved into the garden soon. We have a watermelon and two pumpkin seed "cartridges" (you stick them in the dirt and they grow from there) that haven't yet shown any signs of sprouting just yet. 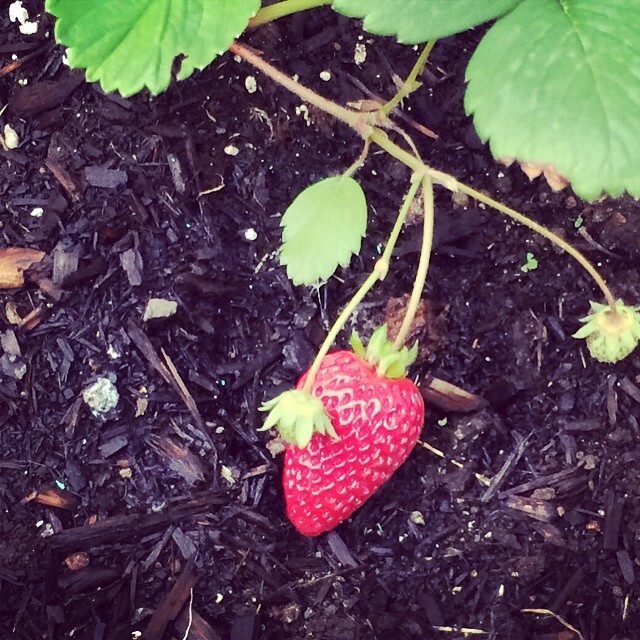 We have strawberry plants that have their first (green) strawberry! And we have carrots, radishes, lettuce, zucchini and spaghetti squash seeds to plant soon too! Now to wait the three months before we can even eat anything from the garden - If I can protect it from the crows, neighbourhood cats, our dog, the child-thing and my terrible luck with plants until then! Do you have a green-thumb? What's your favourite things to grow in a garden? Yup, two and a half months later, we have finally gotten Dean his shots. He was scheduled for his appointment on time, but then we had that nasty flu and bad fever that wouldn't break. As so I rescheduled it for a few weeks later. And then he had a cold and we had to cancel it again. His shots were scheduled for today. And yesterday morning, he woke up with a case of Pink Eye. He stayed home with us and came to the midwife appointment in the morning and was very excited to go see the "baby doctor" and listen to the heart. Dean went on about the baby all morning after our appointment. Everything is going well with baby - I've maintained my weight, even though I figured I would have gained 10lbs from the junky foods and the amount we've been eating out lately. Baby's heart rate is good and everything is where it should be. The results from the second part of the SIPS wasn't in just yet but unless they call us in, we don't need to worry about that. Our ultrasound is in two weeks and we will find out what we are having at the appointment! I go back to my midwife in a month. And I likely won't have to see the dietitian unless there's a change in weight. Yay! Jason and I had appointments at the family doctor in the afternoon and they were able to squeeze Dean in with us. Our family doctor confirmed Pink Eye and prescribed some drops. She also gave us the go-ahead to send him back to daycare and to get his shots today. Dean has been a champion about getting drops in his eye. He doesn't fight or even wiggle around when we lay him down and he knows it's coming. The doctor warned us it might sting a little bit, but Dean hasn't seemed to notice or care. This morning we loaded him into the car again and he rode the whole way to the Public Health Nurse saying "more doctor" (Poor kid has only been to the doctors aside from outside at home and inside playing with trains in the past two days due to his contagious eye) He wasn't very happy about getting his height and weight measured and there were some tears. But he was a tough cookie when we got his shot. It was just one needle this time, thank goodness! Jason held him on his lap with his arms snuggled tight and the nurse was very fast to poke him and be done. Dean cried for a few moments but cheered up when the bubbles came out. We played in the waiting room for the required 15 minute wait time and he didn't seem to care about the shot anymore... Until the nurse came out to give me a pamphlet and then Dean ran over and asked to hold my hand (Translation : NOOO! Don't let her jab me again!) We came home and played in the backyard and all was well in the world. I was relieved to hear that these are the last shots until around 4-6 years old - until I realized that in about 6 months, I will be back there with baby to start their rounds of shots. Then when they are Dean's current age and done shots, I will have to bring Dean in for his. It's never ending! Ugh! I cried more than Dean did for most of his shots - like I said, I am a total sissy. I'm getting better though. I know it's needed and I know it only hurts for a second and then it's over but it's still so heartbreaking knowing that you have to hold them still so that they can go through that little bit of pain. I know I will definitely be booking shots for the baby when Jason is off work or after working hours so he can be the meanie!! 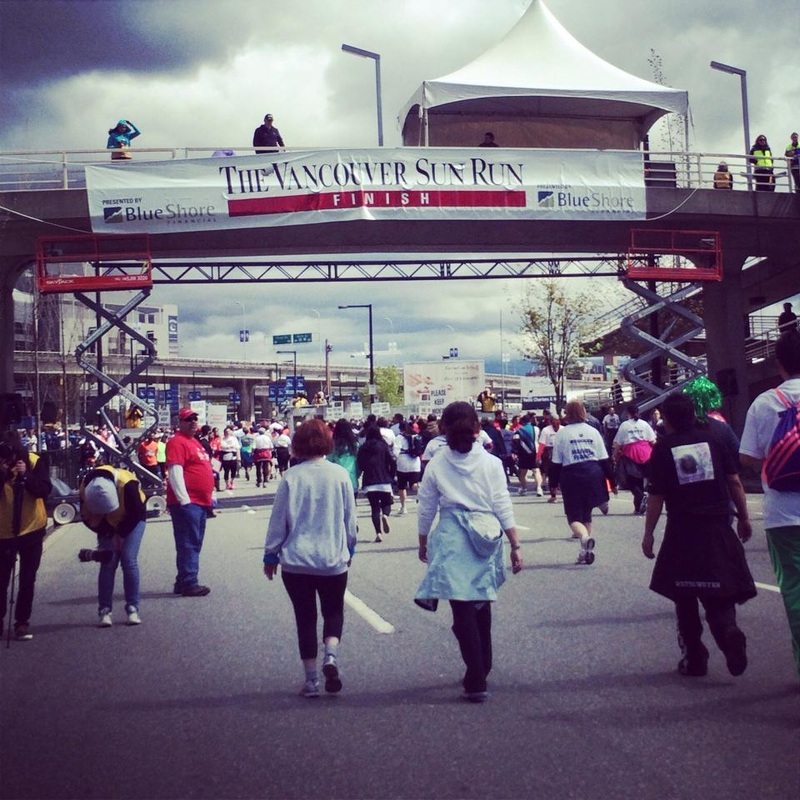 I finished my first 10k! Walked half of it, but I was still happy to just finish!